I hope you all had a fantastic weekend! I had a great Sunday, I mostly spent it with friends on my roof enjoying great conversations and good food. I definitely can't complain about that! In a recent swap, I was pleasantly surprised when I got a new to me indie as an extra, called Piper Polish Flash Mob. 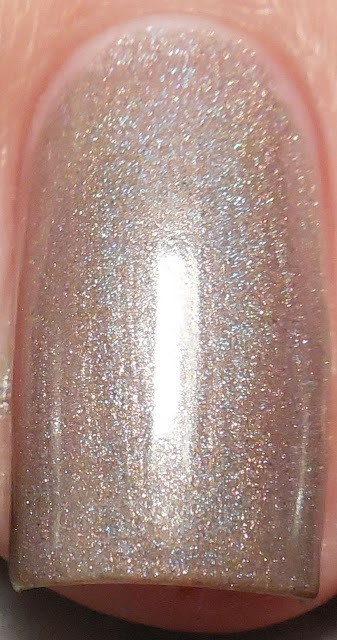 It's a pretty taupe shimmer that has a slight holo under direct light. I found application to be a touch on the watery side and it took three coats to even out. No basecoat or topcoat in these pictures, taken in direct light. I have to admit, I do like the name of this polish because I've always wanted to be in a flash mob. It doesn't hurt either that it's an office appropriate polish with a lovely hidden holo that gives it some extra spice. Flash Mob has piqued my interest in the rest of Piper Polish's colors and I'll be keeping on eye on more developments from this line.